Andrew Sullivan for The New York Times. Literary associations have not yet sold the home of William Styron in Roxbury, above, which has been listed six months. The price has been reduced to $1.895 million. Andrew Sullivan for The New York Times. Also in Roxbury awaiting a buyer is a colonial with pool and view, $2.895 million. JUST as the leaves are beginning to turn along the country lanes, Stacey Matthews is anticipating a fall season that will transform the local housing market as well. Nearing the end of a sales year so abysmally slow that the number of houses sold in Roxbury only ticked into the double digits last month, Ms. Matthews, an agent with William Raveis, has country homes galore to sell here in this part of Litchfield County. She can offer houses connected with luminaries, houses with drop-dead views, and more than a few with impeccable interiors. But while her target buyers those in line for fat Wall Street bonuses have begun to browse in Litchfield over the past month or so, prime isnt the only descriptor theyre looking for in a weekend property. Everybody wants a deal, Ms. Matthews said. Thats their No. 1 concern. Thus, an air of resignation mingles with the scent of fall these days in the Litchfield hills. Throughout a region known to affluent weekenders as the anti-Hamptons, sale prices are generally down about 30 percent from asking, agents said. Many of the properties on the market have been heavily discounted. Of course, deep discounts dont mean much if a property is grossly overpriced at the start, but the lower prices, accompanied by dramatic drops in overall sales volume, are a reflection of this markets hypersensitivity to slumps on Wall Street. What we offer is a luxury, and its an unnecessary luxury, said Gael Hammer, an agent with Klemm Real Estate in Washington Depot. You can live without your second home. The 10 closed sales in sparsely populated Roxbury during the first eight months of the year represented half of last years volume. Rates of decline were similar in Washington (15 sales), Bridgewater (4) and Warren (5). Sales activity has definitely picked up since July. Klemm reports that 20 properties, worth a total of $30 million, in lower Litchfield are either under contract or on the verge of a contract since early August. But the wait for this uptick has been painfully long. During previous recessions, the markets finite number of houses offered greater protection, said Mr. Hammer, who has sold in the area for 25 years. In those instances, inventory was never too far out in front of demand. This time, the countryside has suffered more than some of its suburban neighbors. According to data from William Raveis, as of the end of August, many towns in the countys lower half had at least four years worth of inventory, based on the existing pace of sales. Buyers are using the surplus to their advantage: a house on 29 acres on the Washington side of Lake Waramaug is under contract for upward of $4 million, close to $2 million less than the asking price. At this point, Ms. Matthews said, I dont even want to take listings from people who just want to test the market and see if they can get their price. They should just wait for five years, because buyers arent interested. She is busily cutting prices on the listings she already has. Just last week, she reduced the price on the colonial in Roxbury where the literary lion William Styron wrote and entertained for decades. Still owned by Mr. Styrons widow, Rose, the five-bedroom house is well suited to the weekender lifestyle, with an Adirondack-styled great room, a saltwater pool and a two-bedroom guest house. The downside is the old, worn kitchen, along with other needed updates. 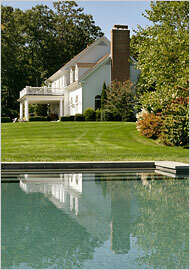 It was listed in May for $2.2 million; the new price is $1.895 million. Elsewhere in town, a 6,000-square-foot Georgian colonial that appears to fulfill even the most demanding checklist has been on and off the market for two years or more. Arresting backyard view? Check, with an infinity-edge pool. Updated interiors? Check, complete with lower-level media room. Ample acreage? Seven. And even better, the property is on a dirt road, a chichi thing, as Ms. Matthews put it, in a place where nearly everybodys playing at living the rural lifestyle. Still, only since the sellers lowered their price to $2.895 million from the original $3.2 million have buyers started asking serious questions. Then theres the designer-perfect renovation across from the television actor Michael Lombardis house. Expanded, designed and furnished by the owners of the Tulip Tree Collection, a furniture store in Washington Depot, the house has the kind of kitchen that comes with two of everything (dishwashers, sinks, et cetera.). Detail-oriented buyers would presumably swoon for the basket-weave patterned floor in the foyer (inspired by a French chateau), the varied tray ceilings, and the raised fireplace in the dining room (affording seated guests equal gazing privileges). Originally offered at $2.75 million, the house is now down to $2.195 million, with rental as an option. The second-home slowdown forced Wayne Piskura, the former owner of Tierney Realty in Roxbury, to merge his agency with Klemm. A fixture in the Roxbury market since the early 1990s, Mr. Piskura says he is hopeful that the worst is over.